Each month thousands of readers learn new truths from Ambassador College publications. But in their zeal, many have made the mistake of trying to "convert" others to their newfound way of life, Read this article and learn how to avoid alienating your friends and family as you learn more of God's Word. NOTHING is more exciting than discovering new truths from God's Word. Learning the keys to happiness and eternal life is the most thrilling study you could ever engage in. And the most natural desire is to want to share these fascinating truths with others. But, before you attempt this — be cautioned! Learn some vital lessons from the experience of others! Many enthusiastic readers have rushed out to enlighten their loved ones only to be snubbed with, "That's crazy, idiotic, blasphemous, ridiculous." Some have been labelled as fanatics and crackpots — and even ostracized or disowned by their families. By understanding a few basic Biblical principles, you can avoid such pitfalls as you learn new truth and change your way of living. First, that commission was to WITNESS to the world, not to CONVERT the world. Read Matthew 24:14: "And this gospel of the kingdom shall be preached in all the world for a witness unto all nations...." Prophecy shows that only a small minority of mankind will be converted before Christ returns — but that the whole world will have been witnessed to! Secondly, the preaching part of that commission was given specifically to Christ's apostles, who had been ordained as ministers. "Go ye therefore, and teach all nations..." was delivered to the 11 disciples (Matt. 28:19, 16). The statement "What I tell you in darkness, that speak ye in light: and what ye hear in the ear, that preach ye upon the housetops" was previously made to the 12 disciples (Matt. 10:1, 27). Amazingly, Christ plainly instructed the average laymen of His day not to advertise His miracles. In five separate cases He told those aware of a healing or miracle not to say anything to anyone about the incident. Only once do the Gospels report Christ's having told someone to mention what had happened to him (Mark 5:19 and Luke 8:39). This man (who had demons cast out of him) was directed to go to his house and tell his friends what had been done for him. Of course, he reacted as many TOMORROW'S WORLD readers would be inclined to do today. He published the news of his healing throughout the whole city — and he undoubtedly made some enemies in the process. The point is this: It is simply not the duty of laymen to preach to their community. That responsibility rests on the shoulders of those called and chosen by God to do that Work. Paul said, "... Woe is unto me, if I preach not the gospel!" (I Cor. 9:16.) And woe unto God's ministers today if they do not preach the Gospel; but it is their responsibility — and not the role of those just beginning to understand God's Word. Romans 12:5 explains that there is one body called to do the Work of God — but that each member of the Body has a different responsibility. In verse 6 Paul talks about differing gifts given to various members of the body - prophesying, ministering (serving), teaching, exhorting, giving, ruling, and showing mercy. There are many very necessary functions within the Body that do not involve preaching. In discussing the same principles with the Corinthians, Paul wrote, "For the body is not one member, but many. If the foot shall say, Because I am not the hand, I am not of the body; is it therefore not of the body?... If the whole body were an eye, where were the hearing? If the whole were hearing, where were the smelling?" (I Cor. 12:14-17.) In verse 29 he asked, "Are all apostles? are all prophets? are all teachers? are all workers of miracles?" Paul was explaining to the Romans and the Corinthians that all of the responsibilities in the Body of Christ are necessary — but only a few involve preaching. Certainly the telecast, The WORLD TOMORROW broadcast, and TOMORROW'S WORLD magazine, and all the literature published by Ambassador College could not be freely given to the world without the support of the entire body. James cautioned, "Let not many of you become teachers, my brethren, for you know that we who teach shall be judged with greater strictness" (James 3:1, RSV). The living Jesus Christ, as the Head of God's physical Work calls and appoints those responsible to teach, preach, and expound His Word. All others have a very important — but a non-teaching — role in fulfilling the commission to witness to the world. Though God is not calling most to actively teach His Word, He has provided an outlet for those who are brimful with enthusiasm about the right way of life. Peter wrote, "...Be ready always to give an answer to every man that asketh you a reason of the hope that is in you with meekness and fear" (I Pet. 3:15). Everyone who knows the answers to the whys and wherefores of human existence should be ready and willing to share that wonderful knowledge with those who ASK. But all too often the tendency is to take every principle inquiry as an opportunity to launch into a long dissertation — expounding all that one has recently learned and denouncing the evils of this society. Solomon wrote of that proclivity of human nature in Proverbs 29:11: "A fool uttereth all his mind: but a wise man keepeth it in till afterwards." If someone is sincerely interested in God's way of life, you should certainly answer his questions to the best of your ability — but don't be like the fool of Proverbs 29:11 who expounds all he knows. Tell the questioner enough to satisfy him for the moment; but leave him with enough curiosity to come back later with more questions. And then, most importantly, point that individual to the Work through which God is witnessing to the world. Encourage him to write for The PLAIN TRUTH, TOMORROW'S WORLD, or some of the booklets that cover his questions. Suggest he listen to The WORLD TOMORROW, or watch Garner Ted Armstrong on television. Perhaps you could even give him some of your magazines or booklets. But remember, no layman, no minister, no human being is able to convert anyone. Only God can open someone's eyes to the Truth (John 6:44). If God is working with one of your friends, he will want to learn more — and he will be willing to go to God's chosen servants to get answers. And if God is not opening his mind, you will only arouse antagonism by pushing these truths on him. To understand this principle better, write for our free article "Is This the Only Day of Salvation?" One important key in answering questions about God's plan for mankind is to communicate with others in terms they understand. 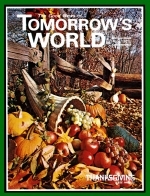 TOMORROW'S WORLD magazine teaches truth, but in terms the average person understands. There's no need to use ancient, religious, sentimental, or sanctimonious language in preaching the Gospel — that kind of talk actually "turns off" most people. Paul was quick to point out that he would bend over backwards not to offend someone. Study I Corinthians 10:32-33. Even though Paul was an ordained minister — commissioned to actively preach the Gospel — he did his preaching in terms the people of his day understood. "And unto the Jews I became as a Jew, that I might gain the Jews.... To the weak became I as weak, that I might gain the weak: I am made all things to all men, that I might by all means save some" (I Cor. 9:20, 22). Most who heard Paul preach were not being called by God — yet he talked their language so they would listen long enough to hear his witness. And for the few whom God was calling, Paul used terms they understood so they would not be offended or held back in any way. Learn from Paul's God-given wisdom. Talk to others in terms of their interests. Be friendly and convivial — let your light shine. Then, if they ask questions, have answers. But don't be like one individual who proudly proclaimed, "I always manage to work the Bible into my conversations." "Bible talk" is simply not what most people understand or appreciate. The big responsibility of those who have learned and are learning the Truth is to be AN EXAMPLE to their friends and family. Christ said in Matthew 5:16, "Let your light so shine before men, that they may see your good works, and glorify your Father which is in heaven." Notice, He said, "SEE your good works"! WORKS not words! Peter exhorted all Christians, ''Maintain good conduct among the Gentiles, so that in case they speak against you as wrongdoers, they may SEE your good deeds and glorify God on the day of visitation" (I Pet. 2:12, RSV). Others should SEE, not hear, all the benefits of living by God's Word. Peter went on to discuss the relationship between a wife who had learned of the Truth of God and a husband who wasn't interested in her new way of life. "In the same spirit you married women should adapt yourselves to your husbands, so that even if they do not obey the Word of God they may be won to God without any word being spoken, simply by seeing the pure and reverent behavior of you, their wives" (I Pet. 3:1-2, Phillips). As God begins to work in your life, as you learn the happy way He designed for mankind, as you begin to live for a goal and purpose, those around you will certainly notice a change. They should see that change before they hear all about it. But stop to analyze for a moment what changes others are most likely to see in your life. It's all too easy to go overboard in being concerned about physical things such as diet, clothing, entertainment; or to make a show of Bible study or prayer. It's easy to parade the Bible or various booklets in front of those who are not interested. These physical things will simply not impress many people. But if others see a change in your outlook on life; if they see the normal worries, doubts, insecurities, and frustrations disappearing; if they begin to see more happiness, joy, and contentment; they can't help but be impressed. Many points of God's Truth may rub a hostile mind the wrong way; but who can dislike or disparage love, patience, and kindness? Who can complain of a more helpful neighbor, a more loving wife, a more patient husband, a more industrious employee? The big question is: Which will predominate as you change your way of life? Will the little physical changes that a carnal mind cannot understand stand out? Will your vocal efforts to convert others become a byword in your neighborhood? Or will people begin to see a better neighbor, parent, and citizen? Will your life become a real bright spot in the community — in spite of the fact that some of your ways may be considered a little strange or different? Will others begin to see in you those qualities they would like to have? The Christian way of life is what every human being wants — but does not know how to get. It is happy, abundant, balanced, and purposeful. Let others see those characteristics in you. As you learn new Truth, don't TELL the whole world about it — that is the job of God's chosen servants. Let the world SEE what that Truth is doing for you!